The actor also shared some very heartfelt photos on social media. Ryan Reynolds is about as sarcastic and witty as they come, especially when he's donning the mask of Deadpool. But while filming the sequel to the hit Marvel film recently, Reynolds made no jokes (well, maybe just a few) when he welcomed Make-A-Wish and Children's Wish Foundation kids to the set for some laughs, a few gifts and a whole lot of inspiration. As Deadpool would, say, it was "maximum effort." "One of the best parts of playing the Big Red Jacka-- is welcoming @makeawishamerica and @childrenswishfoundation onto set," Reynolds posted on Instagram Monday. The actor also touched upon the fact that Deadpool's origin story involves conquering cancer. (vancityreynolds/Instagram) Ryan Reynolds posted photos to Instagram with the caption, "One of the best parts of playing the Big Red Jackass is welcoming Make A Wish America and Children's Wish Foundation onto set. Deadpool kicked Cancer in the taint, but these kids do it for real every day." on Feb. 19, 2018. 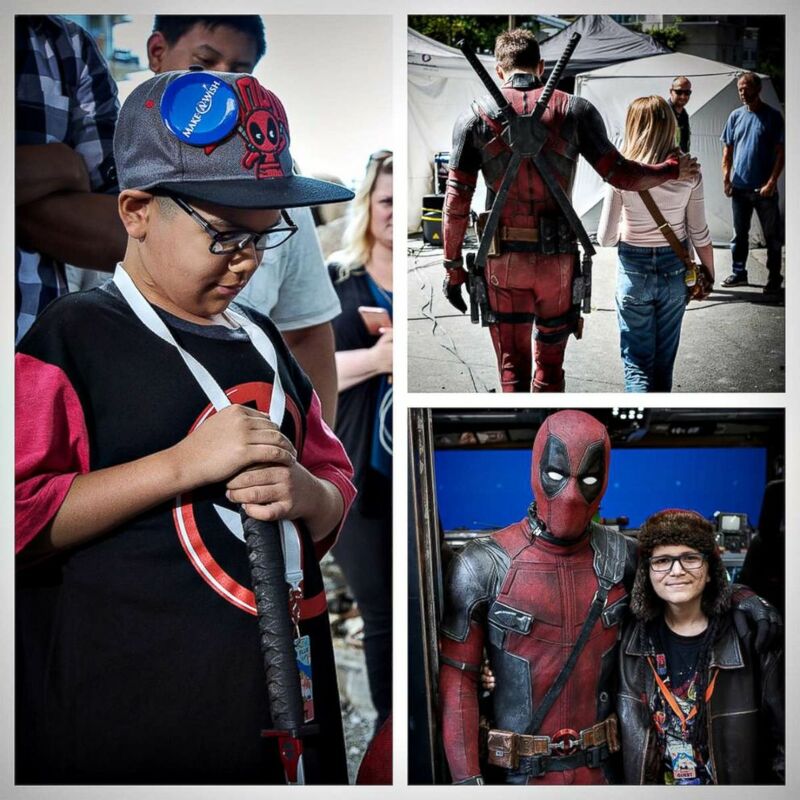 "Deadpool kicked Cancer ... but these kids do it for real every day," he wrote. "These foundations make dreams come true for a lot of super-brave kids. They also make dreams come true for parents, who just wanna see their kid smile. HUGE thanks to our Prop Master, Dan Sissons, for making sure every kid left with his/her own sword. (Bamboo versions. Not stabby-stabby versions.)" Reynolds posted a slew of pics alongside his new friends. Each Deadpool prop sword the children were holding looked to be signed by Reynolds himself and the smiles on their faces were contagious. Make-A-Wish America also posted on Instagram a collage of pictures, writing in the caption a giant, "Thank you" to Reynolds. Casey Thompson, the national communications manager for Make-A-Wish, told ABC News that the visit happened sometime this summer. "Ryan is such a great wish granter and supporter. He's hosted in the past and we are just incredibly grateful for all that’s he's done," Thompson said. "Every single [kid] left and said that this was the best day of their life," she added. The "Deadpool" sequel hits theaters on May 18.